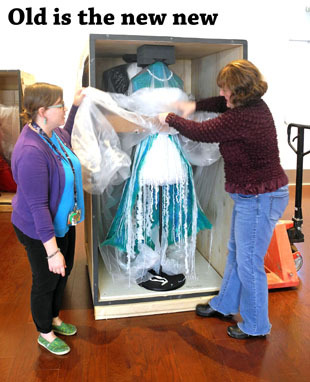 Erin Loveland, teen services librarian at the Artesia Public Library, and Nancy Dunn, Artesia Historical Museum manager, unpack a dress made from recycled plastic bags from beneath its protective covering this morning in preparation for “ReDress: Upcycled Style,” an exhibition of recycled fashion. The exhibit officially begins Jan. 9 in the museum’s Art Center. Loveland will also be holding several recycled workshops for both adults and children at the Artesia Public Library. The first one is scheduled for 6 p.m. Tuesday, Jan. 12, and will allow adults to make scarves out of t-shirts.